One of the Car Talk guys visited the BirdNote booth - and bird - at a PRPD Conference. BirdNote is a self-contained 1:45-minute feature about the intriguing ways of birds. Each episode mixes high-quality natural audio, entertaining stories, and the interesting facts that public radio listeners love. Airing originally on KNKX, Seattle/Tacoma, the show is now heard from California to Connecticut, and Texas to Alaska. BirdNote is not “just another nature program.” Shows convey a strong sense of place, from urban to rural, from the Arctic to Argentina. 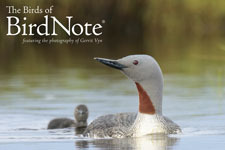 For more information, contact Sallie Bodie, Managing Director, at sallieb@BirdNote.org or 206-283-1254. I get comments all the time from enthusiastic listeners who don’t know one bird from another. They love BirdNote! BirdNote is a big hit on stations where it airs. KNKX aired it weekdays since February 2005, and in 2008 began airing it daily. KNKX Assistant General Manager Joey Cohn reports extremely positive listener response to BirdNote. In a 2013 survey, more than half of radio listeners said they tuned in to Birdnote at least four times a week. BirdNote also attracts underwriting. WNPR/Hartford drew $96,000 in premiums and private underwriting for BirdNote in a little over two years. Distributed digitally via ContentDepot. Digital FTP download of 256 kbps MP3 or MP2 files also available. Shows available periodically for download via PRX. Custom promos and fundraising support available. Exclusivity negotiable. BirdNote delivers the high quality that listeners expect from public radio. The program is produced by radio veteran John Kessler, All Blues host and producer on KNKX and former musical director of NPR's Mountain Stage. The theme music was composed and performed by Grammy Award-winning musician Nancy Rumbel. The rich variety of bird sounds is provided by The Macaulay Library at the Cornell Laboratory of Ornithology. BirdNote super-serves the interests of public radio listeners, particularly socially conscious, environmentally concerned nature enthusiasts. BirdNote is appointment radio, a tune-in magnet. Listeners say they tune in just to hear the show and that it’s part of their morning routine. 67% of survey participants listen to the show four to seven times per week. And as loyalty increases, so does listener support. More than 50% of BirdNote listeners report they are regular contributors to their stations. Our morning revolves around listening to BirdNote ... It is our favorite radio show. We appreciate the information, bird sounds and especially the humor packed into those brief segments. -- George and Lynne J.
I have been known to shut off the shower I'm taking in order to hear BirdNote on the radio! It is the best two minutes of my day! -- Vicki W.
As a short feature, it's the perfect segue between the news and other programming, or a sound-rich, tune-in addition to your local news or music program. There's a close affinity between BirdNote and the NPR core audience. BirdNote is well-crafted and entertaining. We've discovered that BirdNote generates good revenue for our fall on-air and online campaigns. Year One exceeded all expectations. I recommend it! After more than five years of airing the show, I hear more and more love for BirdNote.